Paypal - pay with your own funds in your Paypal account. 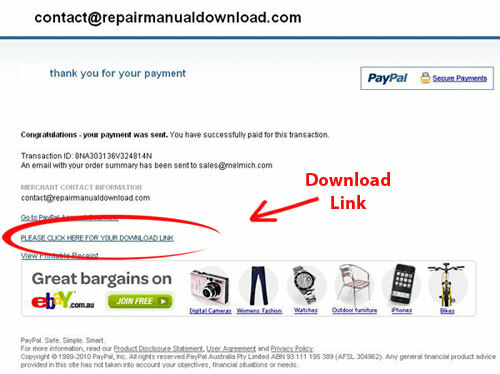 Simply click on either the Credit Card or Paypal links on the page of the manual you wish to purchase. PLEASE take note of the location you are downloading the file to. Once downloaded, if required, extract the file with WINZIP to a location of your choice. Once extracted you will have a PDF file for viewing and printing. If the above instructions are followed, there will not be a problem. If, however, you run into difficulty of any kind please contact us and we will send you an email with a fresh link. This has to be done manually and is usually done within 12 hours (often sooner - depending whether we are in bed or at the computer). Please include your purchase details (method of payment (Credit Card or Paypal), date item was paid for, email address used, receipt number) and what the problem is, ie closed window before clicking link, cannot open file etc.